Mexico constitution and oil drilling: Will Pemex be privatized? Will Mexico amend its constitution to drill for oil? A team removes a drilling tool with a sample of the marine seabed at an oil rig in the Gulf of Mexico operated by Mexican company Grupo R and working for Mexico’s state-owned oil company Pemex on Aug. 30, 2013. Mexico’s oil industry is in a bad way. The country’s once massive petroleum reserves have basically been sucked dry. Production is plummeting, and the state oil monopoly, Petróleos Mexicanos (Pemex) is hemorrhaging money. Unless something is done soon, for the first time in decades Mexico could fall from its coveted spot among the world’s top 10 oil producers. At the same time that classic oil drilling is stalling, the country is sitting on top of fuel sources that are harder to tap: massive amounts of shale oil and gas, as well as deep-water reserves in the Gulf—just like the ones the United States drills. (What, you thought those geological formations stopped at the border?) So why isn’t Mexico going after the same resources that have been so lucrative for its northern neighbor? According to President Enrique Peña Nieto, there’s just one thing standing in the way of Mexico’s rightful petroleum renaissance: the country’s constitution. So he’s asked the government to change it. As it stands, the Mexican Constitution forbids private investment in Pemex. That law has been on the books since 1938, when President Lázaro Cárdenas kicked foreign oil companies out of Mexico for not respecting labor laws. But the restriction is outdated, Peña Nieto argues, better suited to a time when Mexico could count on the easy oil of gigantic, shallow-water reserves like the Yucatán’s Cantarell. 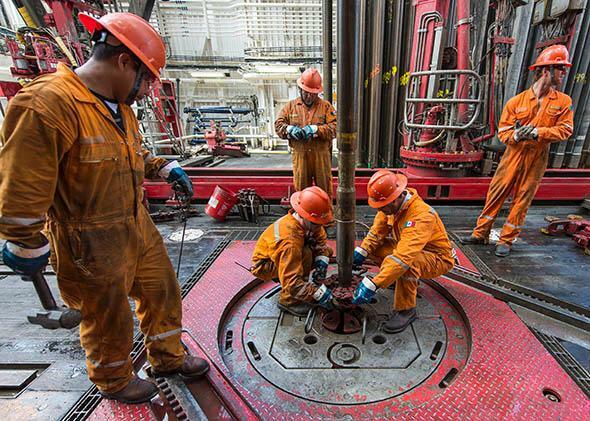 New techniques such as fracking and deep-water drilling are much more complicated and expensive, and Pemex needs help keeping up. With a couple of quick amendments, Peña Nieto says, Mexico could open up Pemex to private investments and encourage profit-sharing partnerships with the world’s major oil companies. Expertise would flow in, production would soar, and energy prices for Mexicans would plummet, he promises. A vote is expected by the end of the year. “The equivalent in the U.S. would be privatizing social security,” says John Ackerman, a law professor at the National Autonomous University of Mexico (UNAM) in Mexico City—except worse, because Pemex has essentially funded the entire Mexican state for more than half a century. In 2011, 34 percent of the Mexican government’s total revenue came from Pemex. Taxes, meanwhile, consistently account for less than 20 percent of Mexico’s GDP. (In the United States, taxes make up about 25 percent of GDP. In Norway, they are more than 40 percent.) Oil revenues subsidize everything from energy costs to health care to public universities. But even critics of energy reform admit that the Mexican government’s overreliance on oil money has created problems for Pemex. Because it is responsible for supplying more than a third of the state’s funds, Pemex has little money left over to invest in exploratory drilling or R&D for new technologies. What’s more, Pemex’s political connections make it easy for corruption to thrive. “The fundamental problem is that Pemex isn’t an independent, autonomous business. It’s completely controlled by whatever government is in power at the moment,” says Luca Ferrari, a geologist at UNAM who has studied energy issues. Few people in Mexico want to leave Pemex limping along in its current state, unable to invest in its future and doomed to fall behind major international oil companies. But the problem with Peña Nieto’s proposal, experts say, is that no one knows what it will actually do. As Ferrari puts it, “The constitutional amendments open the door, but we don’t know how far.” Details about structural changes to Pemex—not to mention the specifics of any partnership with a foreign company—would be hashed out in so-called secondary laws after the constitution has already been amended. At this point, no one knows if Peña Nieto’s reform will actually solve Pemex’s problems. Mexico’s long and disappointing history with privatizations disguised as reforms gives the country another reason to be wary, Ackerman says. In the late 1980s, for example, the Mexican government decided to privatize telecommunications. Two decades later, Mexicans pay through the nose for mediocre phone and Internet service. Cellphones are even worse—if you sign the most basic two-year contract with Telcel, Mexico’s near-monopoly cellphone provider, you’ll pay nearly $700 up front for the cheapest iPhone 5. If you sensibly opt for a cheaper phone without a contract, you’ll have to constantly recharge your minutes and megabytes at outrageous rates that skyrocket at the slightest hint of roaming. And who’s raking in all that cash? Carlos Slim, the CEO of the telecom monopoly Telmex and the second richest person in the world. He made his fortune as Mexicans struggled to place a call. What was once touted as reform is now recognized as nothing more than “the creation of a private monopoly instead of a public monopoly,” Ackerman says. Who’s to say the same thing won’t happen with Pemex? There are plenty of other reasons to be skeptical of the government’s “more oil!” message. Why is Mexico so eager to build its own Deepwater Horizon anyway? And after a devastating rainy season that peaked with simultaneous hurricanes on both coasts, climate change is on everybody’s mind. “Mexico should continue to maintain complete control of its oil and gas—not in order to exploit it, but rather to be able to leave it where it is,” argues Eduardo Rincón, a renewable energy expert at the University of Mexico City. Mexico already lags behind the rest of the world in renewable energy, Rincón says, and an energy reform that ignores promising resources such as solar and wind won’t help it catch up. Although the government says renewables will eventually be part of the plan, the specifics are on hold, waiting for those elusive secondary laws. Ferrari and Rincón suspect they will be merely cosmetic. So what kind of reform does Pemex really need? First of all, the company needs to be allowed to invest in itself rather than turn over its profits to the state, says Fluvio Ruiz, a Pemex board member. But even more importantly, he says, Pemex needs to turn itself into “an energy company, not just an oil company”—something that’s a lot harder than slapping a couple of amendments on the constitution. After all, even shale and deep-water oil reserves won’t last forever, and the era of cheap, easily harvested energy is over. It remains to be seen if Pemex is too.